Combine dry ingredients and cut the butter into them until crumbly and no butter is visible. Mix the yolks, sour cream, and vanilla together in a separate bowl. Add the liquid to the dry and mix just until incorporated. Whisk the sugar and pectin together. Combine with cranberries in a 2-quart pot. Bring to a boil and add orange juice. Boil for 2 minutes. Chill and let set completely in the fridge. Mix dry ingredients together. Cut butter into the dry items and mix until crumbly and no butter is visible. Use cooking spray on a 9-inch cake pan and line with parchment paper. Pour the cake batter into the lined pan. Pour cranberries on top. Top with the streusel and bake approximately 40 minutes at 350 F. Test with a toothpick. It should come out clean and cranberries will be bubbling. Serve at room temperature. 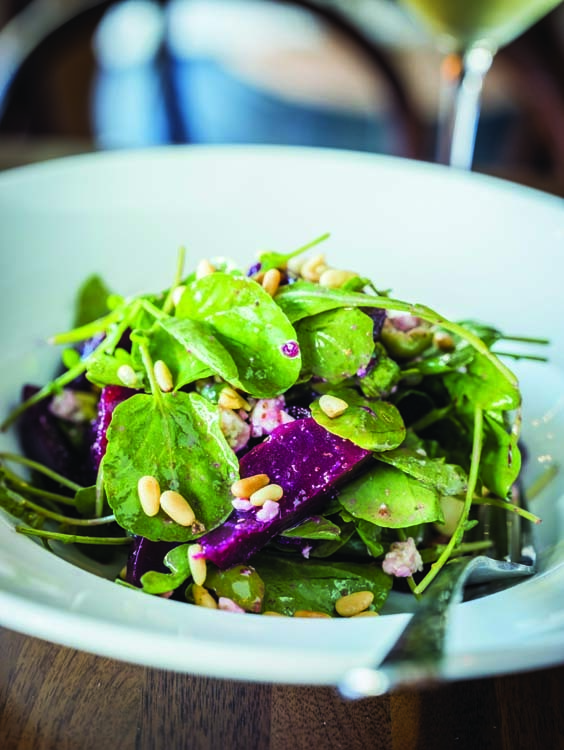 Central Kitchen & Bar: Pickled beets with Gorgonzola, red onion, pine nuts, watercress, and castelvetrano olives, tossed with white balsamic vinaigrette.